Explanation: Dodging powerful laser beams, a drone captured this stunning aerial view. The confrontation took place above the 8.2 meter diameter Very Large Telescopes of the Paranal Observatory on planet Earth. Firing during a test of the observatory's 4 Laser Guide Star Facility, the lasers are ultimately battling against the blurring effect of atmospheric turbulence by creating artificial guide stars. The guide stars are actually emission from laser excited sodium atoms at high altitudes within the telescopic field of view. Guide star image fluctuations are used in real-time to correct for atmospheric blurring by controlling a deformable mirror in the telescope's optical path. Known as adaptive optics, the technique can produce images at the diffraction limit of the telescope. That's the same sharpness you would get if the telescope were in space. A direct beam view at ~4:28. What are we seeing in the APOD and video? This observatory is high altitude, in a very dry desert. We can see the beams, so they are illuminating something. Dust! That's the same sharpness you would get if the telescope were in space. in space as part of the President's new "Space Force." Dust. Water vapor. Even oxygen and nitrogen. Rayleigh scattering off all these is strongly biased along the optical axis. Look almost along the beam of a laser pointer and the scatter will be much more evident than seeing it from the side. Yes, though the observation is a little misleading. This performance is only at longer wavelengths, and only in regions right around the artificial guide stars. If you want a sharp, wide field image, the little bitty Hubble mirror still outperforms any ground-based telescopes, regardless of their size or adaptive optics capabilities. What are we seeing in the APOD and video? This observatory is high altitude, in a very dry desert. We can see the beams, so they are illuminating something. Dust! At the location of this observatory, however, I'd expect Rayleigh scattering off of small particles to dominate Mie scattering off of larger ones. But we don't know what the actual conditions were at the time the image was made. And, of course, the image was made very close to the ground, where we're much more likely to find large particles (like John's dust). Either way, though, a laser beam is usually quite evident when we're near its axis even where the air is very clean. The smaller scopes have tracks for moving them around, why is that? And why 25 or 30 parking spaces for 3 scopes? The "Discuss" link takes you to yesterday's * discussion. And why 25 or 30 parking spaces for 3 scopes? It's actually 4 scopes. Called auxiliary telescopes, they are part of the VLTI (Very Large Telescope Interferometer). They are repositioned according to observational requirements. While it's certainly true that the energy density is far too low to damage the drone, don't let that 22 W value fool you. That's 22 watts of luminous power- an energy density of 0.03 J/cm2- a great deal more than you'd get from a 22 W incandescent bulb. While it's certainly true that the energy density is far too low to damage the drone, don't let that 22 W value fool you. That's 22 watts of luminous power- an energy density of 0.03 J/cm2 [0.03 (J/s)/cm2 = 0.03 W/cm2 = 300 W/m2]- a great deal more than you'd get from a 22 W incandescent bulb. 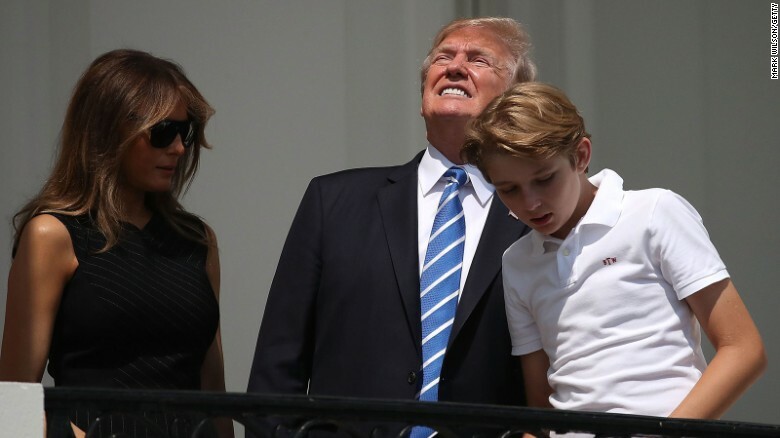 staring at it would be much worse than staring at the Sun. Given an eye pupil size of 2 mm (typical when viewing bright light), inserting your eye into a beam with a power density of 300 W/m2 means you're receiving 1 mW. The same as if you looked directly into the lowest power laser pointers. Staring at these is less dangerous than staring at the Sun. Well...one's eye pupil size may be only 2 mm on a bright sunny day but not at night... at least not at first. And I would imagine that laser pointer spots are also larger than 2 mm. Class IIa: A region in the low-power end of Class II where the laser requires in excess of 1000 seconds of continuous viewing to produce a burn to the retina. Commercial laser scanners are in this subclass. Are Laser Pointers Dangerous to Pilots? I took 3 different green laser pointers, all 5 mW, all of which were purchased for less than $50 each. I measured the spot size at 1, 10, 15, 40 and 97 m. I then plotted distance versus beam diameter and did a best-fit linear slope. I found a slope of 1.04 +/- 0.09 mm/m and a y-intercept of 1.4 +/- 0.5 mm. This means that, at the laser pointer itself, the beam diameter is about 1.5 mm. As it travels, the diameter increases by 1 mm for every 1 m away from the laser pointer. At a distance of 5 m away from the laser, the beam diameter is 7 mm, which is a typical diameter of the dark-adapted pupil (Bradley JC, Bentley KC, Mughal AI, Bodhireddy H and Brown SM 2011, Journal of Refractive Surgery, v.27 issue.3, pg.202). This means that if you are within 5 m of the laser and it is shot directly into one of your dark-adapted pupils, all 5 mW of power will enter your eye, and then be focused onto your retina. At a distance of 10 m, the beam diameter is 12 mm, and its area is 110 sq-mm. Since a 7 mm-diameter dark-adapted pupil has an area of 34 sq-mm, only 1.5 mW of power will enter your eye if this laser is shot directly in. At 100 m, the beam is 10 cm in diameter with an area of 8700 sq-mm, which is 250 times bigger than your dark-adapted pupil. The maximum power which can enter your eye at this distance is 0.02 mW. At a distance of 1 km, which would be typical for a low-flying aircraft, the maximum power which could enter a pilot's eye is 0.0002 mW, or 0.2 micro-Watts. Note that Class 1 lasers have powers less than 0.024 mW, and they carry no warning label because they are incapable of causing eye damage. My little experiment indicates that a Class 3A laser-pointer (5 mW) becomes equivalent to a Class 1 laser at a distance of 90 m or farther. Last edited by neufer on Fri May 18, 2018 7:21 pm, edited 1 time in total. Yeah, but we're talking about staring into the beam. Even if you're exposed to the beam at night, and have a 5mm pupil, you're still only looking at 6 mW into the eye, which isn't going to do any instant damage. The pupil will close down in less than a second. At close range, laser pointers have spot sizes on the order of 2 mm or slightly less. Suffice to say, a 22 W visible light laser expanded to 30 cm diameter poses no real threat to vision, and isn't going to look brighter than the Sun. Your own calculations put the total light entering the eye as roughly equivalent to a Sun stare. about a half minute of arc (for 20/20 vision) rather than a half degree of arc for the Sun. Anyway, again, the point is that these lasers pose no safety risk to anybody passing through them from above. The smaller spot will actually cause a less damage. But in either case, blood flow will carry away the heat. I was basing the small 30" focus on the optics of the eye. If the same amount of light power is focused on a smaller spot then, of course, more damage is done. The advantage comes from both a greater ability to move out of the way of a laser beam and to divert one's gaze. Not everyone is smart enough to avert their gaze. No. The amount of damage has to do with the number of retinal cells that are affected. So a smaller size may well lead to less damage. But in any case, you're not going to focus a point source to that small a spot. Do not confuse the theoretical resolution of the eye, which depends upon the MTF of the system, with the smallest point the eye can focus. Since we're talking about something that requires many seconds of staring to result in damage, and which naturally triggers both a blink reflex and an aversion reflex, I don't think many smarts are required. appears to be CG superimposed on photo background. Actual photos are in gallery and are even more impressive.